You might have a database, but what you might not have are a few features that can greatly benefit how you do business. If you’re one of the unlucky people who finds yourself fumbling though your database wishing it were more optimal and catered to your actual needs, here are four things that every database should have to improve your experience and business processes. Your business revolves around clients, vendors and government contacts, so any business database will most likely have one or all three of those types. Turbocharge your database with a company center that allows you to specify and visualize whether the company record is a client or vendor, keep tabs on contacts and see proposals/order history. A client may call to discuss an old order but they no longer have their order number. You can locate their record in the Company Center by clicking on the order tab and browsing through the order history to find their order. You should be able to open the order straight from the Company Center. Yet another useful feature is the notes tab, where your entire organization can leave notes on orders or clients allowing your company to benefit from one common source of information. One of the most beneficial aspects of having a database is the ability to create quality reports, especially if you’re dealing with a lot of historical records. Your data has hidden gems of knowledge that will make your business more competitive, and a great report generator will allow your business to discover them. A report generator gives you the flexibility to choose parameters that will amplify your reporting. For example, a sales report may analyze one customer, all customers, one salesperson or all at the same time. 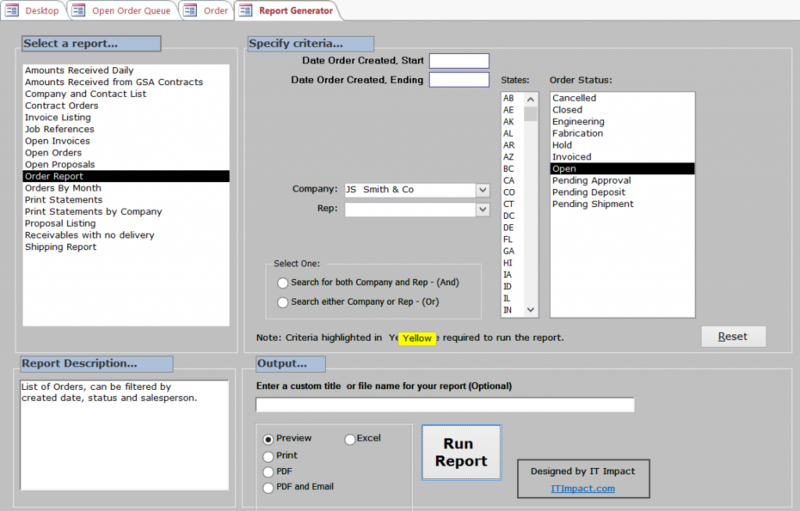 In the example above, users can click on the list of reports, see the criteria available for each report containing multiple output options, including export to Excel. Running a business is based on processes, so it’s only natural for your database to incorporate queues. You might submit a proposal to a customer, and once they approve it, it becomes an order. When the order has been completed an invoice is created, and finally you receive one or more payments. Queues will allow your organization to quickly zero in on each step of the way. Although databases are the best location to store information, a user-friendly design can be a challenge. With tabs you can easily jump around from multiple documents within a single window to quickly access information without opening dozens of windows at one time. 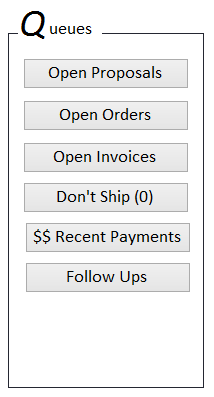 For example, while working on an order, you can leave it open to run a report or view an invoice to retrieve information. All too often we come across databases that have ambiguous labels like “New” or “Create” yet we’re unsure as to what they do unless we start clicking, and who knows where that will lead us. The least amount of effort should be used to effectively get the information you need, and eye candy trumps it all. Your interaction with your database should be easy and frustration free – the information should “flow” intuitively. An attractive interface is: self-explanatory, efficient, integrated, and sometimes interactive. If you need a manual, it’s too hard to use the software! We abhor creating and maintaining manuals – they are a costly tool, time and effort consuming and can be frustrating to use. Instead of manuals, how about putting in the effort to create an intuitive user interface? It’s a win-win situation. 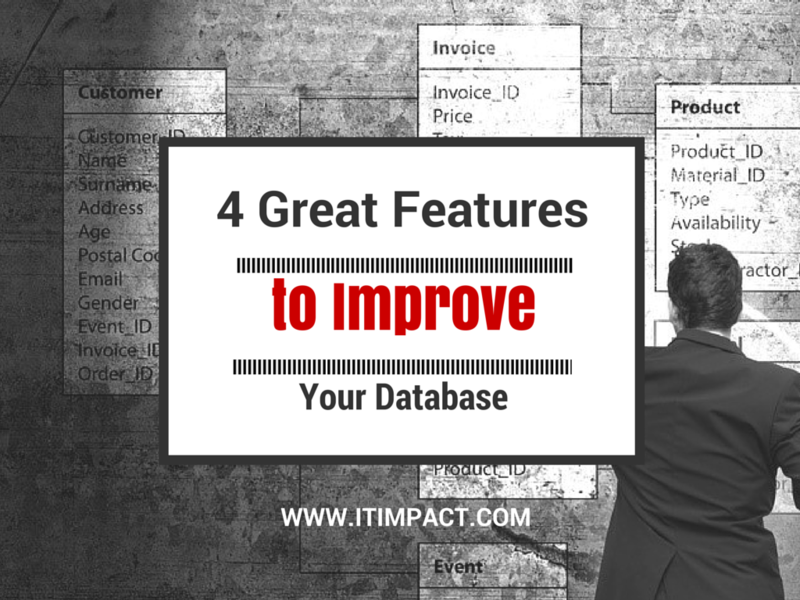 Does your database have these four features? Contact us to find out how we can improve your database today!